Gottlieb, Michael Long, Brit and Koyfman, Alex 2018. Clinical Mimics: An Emergency Medicine-Focused Review of Streptococcal Pharyngitis Mimics. The Journal of Emergency Medicine, Vol. 54, Issue. 5, p. 619. Turula, Holly and Wobus, Christiane 2018. The Role of the Polymeric Immunoglobulin Receptor and Secretory Immunoglobulins during Mucosal Infection and Immunity. Viruses, Vol. 10, Issue. 5, p. 237. Maylin, Sarah Feghoul, Linda Salmona, Maud Herda, Adel Mercier-Delarue, Séverine Simon, François and Legoff, Jérôme 2017. Evaluation the Architect EBV VCA IgM, VCA IgG, and EBNA-1 IgG chemiluminescent immunoassays to assess EBV serostatus prior transplantation. Journal of Medical Virology, Vol. 89, Issue. 11, p. 2003. Gantuz, Magdalena Lorenzetti, Mario Alejandro Chabay, Paola Andrea Preciado, María Victoria and Gershburg, Edward 2017. A novel recombinant variant of latent membrane protein 1 from Epstein Barr virus in Argentina denotes phylogeographical association. PLOS ONE, Vol. 12, Issue. 3, p. e0174221. Alonso-Padilla, Julio Lafuente, Esther M. and Reche, Pedro A. 2017. Computer-Aided Design of an Epitope-Based Vaccine against Epstein-Barr Virus. Journal of Immunology Research, Vol. 2017, Issue. , p. 1. Paik, Jin Ho Choe, Ji-Young Kim, Hyojin Lee, Jeong-Ok Kang, Hyoung Jin Shin, Hee Young Lee, Dong Soon Heo, Dae Seog Kim, Chul-Woo Cho, Kwang-Hyun Kim, Tae Min and Jeon, Yoon Kyung 2017. Clinicopathological categorization of Epstein–Barr virus-positive T/NK-cell lymphoproliferative disease: an analysis of 42 cases with an emphasis on prognostic implications. Leukemia & Lymphoma, Vol. 58, Issue. 1, p. 53. Zhang, Shuo Feng, Juan and Shi, Yifang 2016. Transient widespread cortical and splenial lesions in acute encephalitis/encephalopathy associated with primary Epstein–Barr virus infection. International Journal of Infectious Diseases, Vol. 42, Issue. , p. 7. Cui, Xinle Cao, Zhouhong Chen, Quanyi Arjunaraja, Swadhinya Snow, Andrew L. and Snapper, Clifford M. 2016. Rabbits immunized with Epstein-Barr virus gH/gL or gB recombinant proteins elicit higher serum virus neutralizing activity than gp350. Vaccine, Vol. 34, Issue. 34, p. 4050. Ramasubramanyan, Sharada Osborn, Kay Al-Mohammad, Rajaei Naranjo Perez-Fernandez, Ijiel B. Zuo, Jianmin Balan, Nicolae Godfrey, Anja Patel, Harshil Peters, Gordon Rowe, Martin Jenner, Richard G. and Sinclair, Alison J. 2015. Epstein–Barr virus transcription factor Zta acts through distal regulatory elements to directly control cellular gene expression. Nucleic Acids Research, Vol. 43, Issue. 7, p. 3563. Hunninghake, Ronald 2014. Effect of high dose vitamin C on Epstein-Barr viral infection. Medical Science Monitor, Vol. 20, Issue. , p. 725. YU, XIAO-XIA YAO, CUI-WEI TAO, JING-LI YANG, CHEN LUO, MIAN-NA LI, SHANG-MEI and LIU, HUA-FENG 2014. The expression of renal Epstein-Barr virus markers in patients with lupus nephritis. Experimental and Therapeutic Medicine, Vol. 7, Issue. 5, p. 1135. Santos, Larissa Azevedo, Kátia Silva, Licinio and Oliveira, Ledy 2014. Epstein-Barr virus in oral mucosa from human immunodeficiency virus positive patients. Revista da Associação Médica Brasileira, Vol. 60, Issue. 3, p. 262. Stein, Jamal M. Said Yekta, Sareh Kleines, Michael Ok, Dilara Kasaj, Adrian Reichert, Stefan Schulz, Susanne and Scheithauer, Simone 2013. Failure to detect an association between aggressive periodontitis and the prevalence of herpesviruses. Journal of Clinical Periodontology, Vol. 40, Issue. 1, p. 1. Zihlif, Malek A. Mahmoud, Ismail S. Ghanim, Majd T. Zreikat, Manar S. Alrabadi, Nasr Imraish, Amer Odeh, Fadwa Abbas, Manal A. and Ismail, Said I. 2013. Thymoquinone Efficiently Inhibits the Survival of EBV-Infected B Cells and Alters EBV Gene Expression. Integrative Cancer Therapies, Vol. 12, Issue. 3, p. 257. Calarota, Sandra A. Chiesa, Antonella Zelini, Paola Comolli, Giuditta Minoli, Lorenzo and Baldanti, Fausto 2013. Detection of Epstein-Barr virus-specific memory CD4+T cells using a peptide-based cultured enzyme-linked immunospot assay. Immunology, Vol. 139, Issue. 4, p. 533. Kim, Min Seok Choi, Jin and Jung, Jae Ho 2013. Bilateral Abducens Nerve Palsy in Pediatric Patients with Epstein-Barr Virus Encephalitis. Journal of the Korean Ophthalmological Society, Vol. 54, Issue. 8, p. 1303. Lernia, Vito Di and Mansouri, Yasaman 2013. 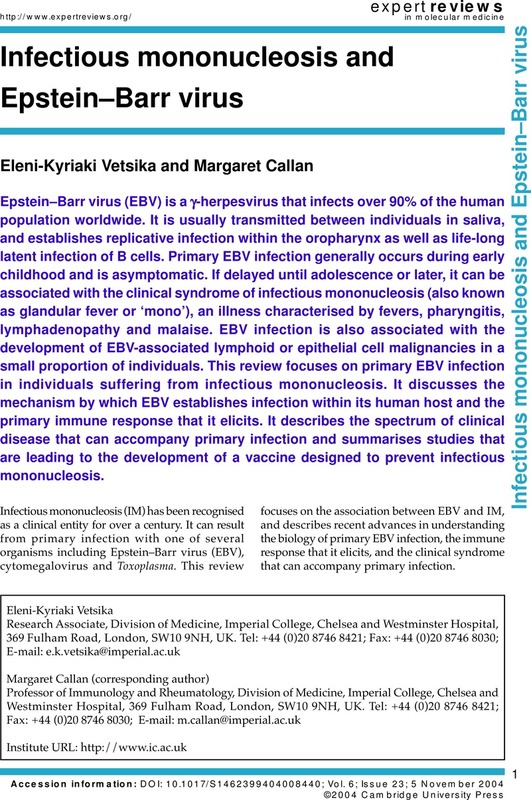 Epstein-Barr virus and skin manifestations in childhood. International Journal of Dermatology, Vol. 52, Issue. 10, p. 1177. Nelson, Danielle D. Taus, Naomi S. Schneider, David A. Cunha, Cristina W. Davis, William C. Brown, Wendy C. Li, Hong O’Toole, Donal and Oaks, J. Lindsay 2013. Fibroblasts express OvHV-2 capsid protein in vasculitis lesions of American bison (Bison bison) with experimental sheep-associated malignant catarrhal fever. Veterinary Microbiology, Vol. 166, Issue. 3-4, p. 486. Cunha, Burke A. Mickail, Nardeen and Petelin, Andrew P. 2012. Infectious mononucleosis-like syndrome probably attributable to Coxsackie A virus infection. Heart & Lung, Vol. 41, Issue. 5, p. 522. Division of Medicine, Imperial College, Chelsea and Westminster Hospital, 369 Fulham Road, London, SW10 9NH, UK.